Broken down in Midwood? We can help. 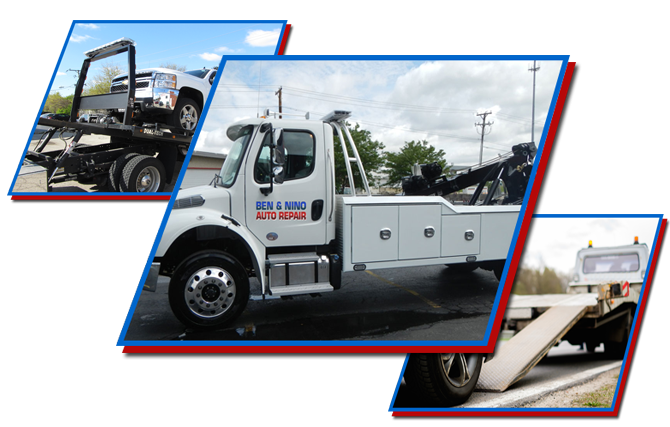 Ben & Nino Auto Repair is the most trusted name in Brooklyn towing. No-accessibility? No worries. We can take your car from point a to point b with little trouble at all. Besides general towing services for your car, we also provide motorcycle towing services along with Blocked Driveway towing and junk car removal. We are always here to help with 24-hour towing and roadside assistance services. We cover all sorts of demands beyond towing. If you accidentally leave those headlights on for a few hours, you don’t have to worry. Call us and we will come jumpstart your battery. Have a flat? We can come change it for you. If after a long day of shopping, you find your keys sitting in the driver’s seat of your car? No need to worry thanks to our car lockout services. And if you manage to find yourself stranded on the side of the road because you forgot to fill up the tank (don’t worry, it happens to the best of us), we will be happy to deliver fuel to you and get you back on the road again. We also provide repairs beyond towing and roadside assistance. We are proud to offer auto body and collision repair, engine repair (including diesel engines), axel and CV joints and driveshaft repairs, electrical systems, differential repairs, brake repair, customs wheels and rims, belt and hoses repair and replacement, climate control systems, exhaust systems, auto glass repair and replacement and lube, oil and filter changes. We here at Ben & Nino Auto Repair are here for the people of Midwood and the surrounding Brooklyn area. Don’t let automotive atrocities get you down. Call (718) 339-8500 and we’ll do everything we can to get you back on the road as soon as possible.